Hi! We recently read some great fantasy Dungeons & Dragon books and when we were done we decided to make some crafts. 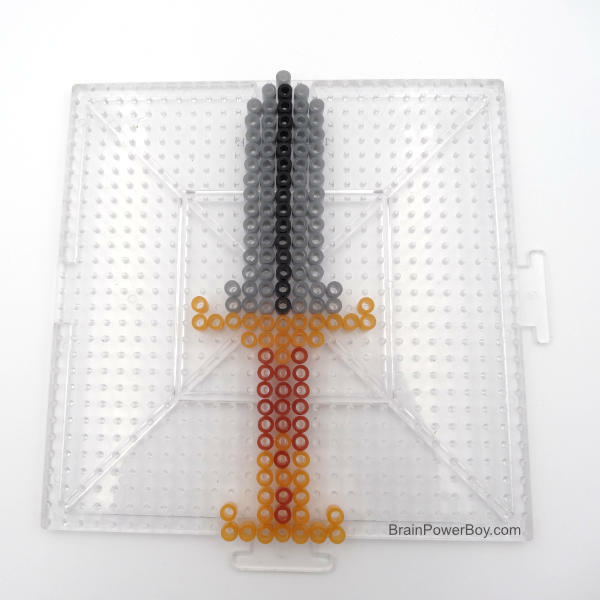 Use these Dungeons & Dragons Perler Bead Pattern ideas for a sword, a shield and a staff to make your own. D&D is a legendary fantasy game which is also a role-playing game. It is a bit hard to explain in a nutshell but generally speaking it is a combination of story telling, quests, battles and medieval style adventures. 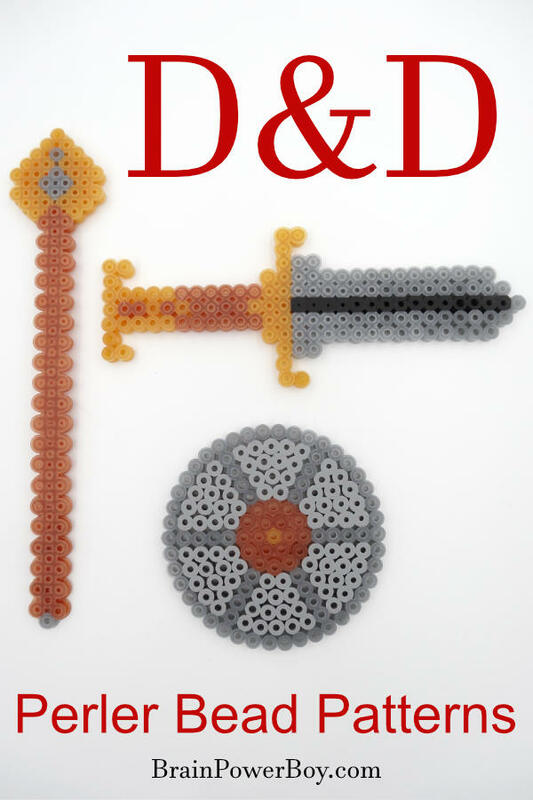 If you like fantasy, these Perler bead projects will be fun to make. Be sure to stop by and see our other Perler Bead Patterns as well. Here are the supplies needed to create the D&D bead projects. Perler Beads from the Metalic Mix, which includes bronze, gold and silver beads, as well as grey beads. Note: I always buy Perler brand but you can also get Hama if you prefer. Visit our Perler Bead Supplies Guide to see the best Perler Bead supplies. Below I will give you general instructions for making each piece. Please use the pictures to work from. But also feel free to make adjustments to the patterns we offer to make it your own. Enjoy! This was made on a square pegboard. 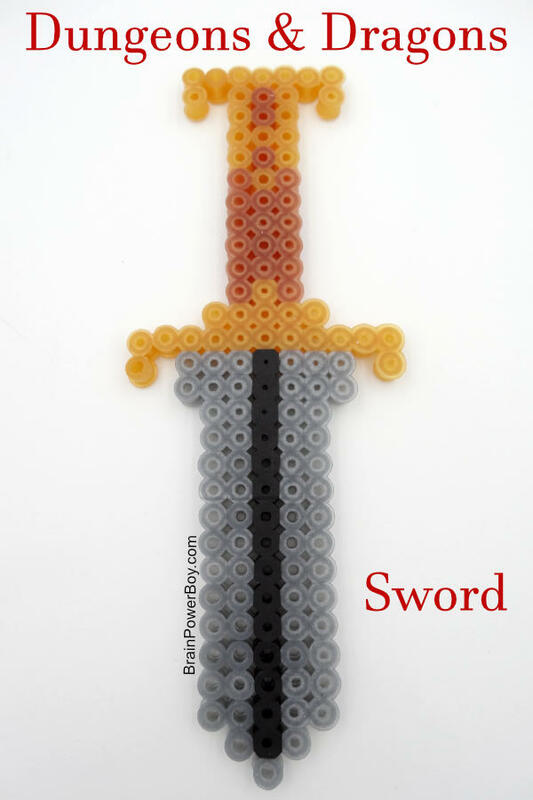 1.The sword is 11 beads wide at its widest part and 29 beads high from the tip of the sword to the top of the hilt. 3. The hilt consists of gold and bronze bead. It is 11 beads at its widest with most of it being 3 bead wide. Here is the completed sword. Next up is the staff. The staff is long with a decoration at the top. It was made on a square pegboard. As you can see from the picture we tipped it on its side to be able to make it longer. 1. The staff is 5 beads wide at its widest point, and 25 beads high. 2. The wooden (bronze color) pole is 2 beads wide and 21 beads tall. 3. There is a silver bead at the bottom of the staff. 4. The top is made with gold and silver beads. 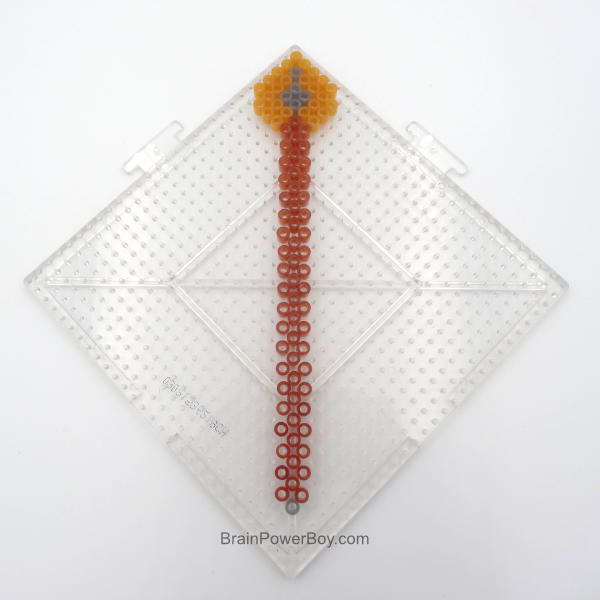 You can look at the picture to follow the pattern or make one of your own. It is 5 beads wide and 6 beads high. Our last project is the shield. 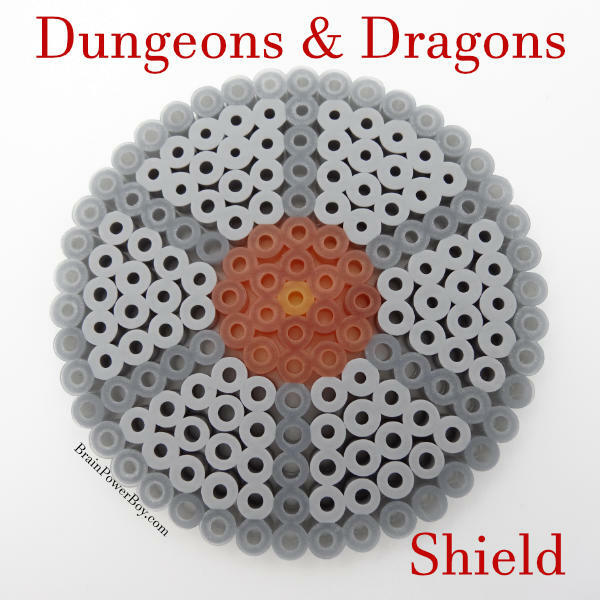 The D&D shield is made on a round pegboard. 1. 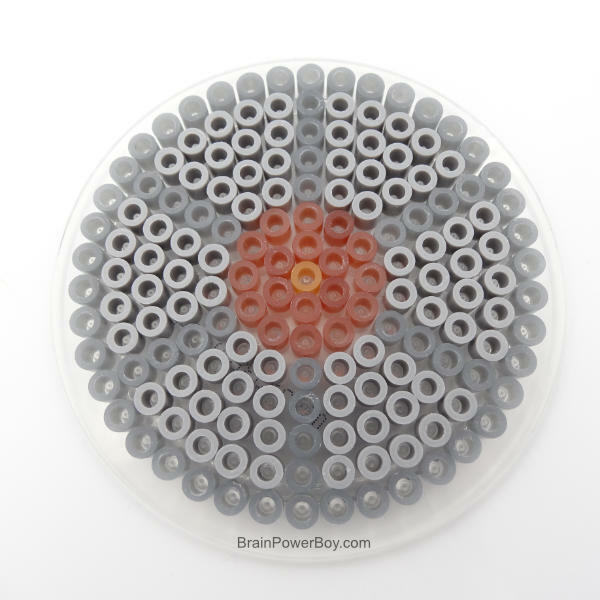 The shield if 15 beads wide and fills the whole small round pegboard. 2. There is a gold bead at the very center. 3. The gold bead is surrounded by 2 rows of bronze beads. 4. The rest of the shield is made with grey and silver beads. 5. Follow the pattern which alternates grey and silver. The stripes and the circle all the way around the shield are silver. 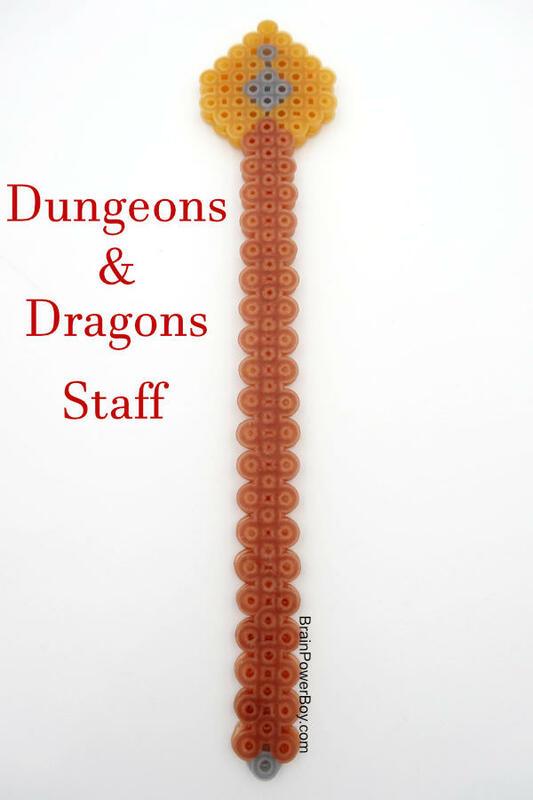 I hope you enjoy making these Dungeons & Dragons Perler bead patterns. We enjoyed designing them! Need more projects to try?